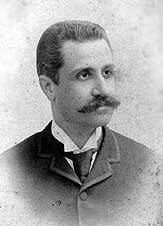 Enrico Cimbali, (Bronte 1855 -- Messina 1887), was lawyer and jurist, very young professor of Civil Rights at Messina University. In his writings theorized new juridical concepts on the work of women and children, on work accidents, on the search of natural paternity and he was an author, among other things, of a study on divorce which appears as a pre-figuration of the current legislation in this matter. Spirit independent and extremely intelligent dedicated his adole­scence and youth to the studies. Also, after the degree, he continued the juridical studies and affirmed himself soon in the national field so to be recognized and acclaimed chief of the new Italian school of private law. He devoted himself to teaching, (became soon ordinary professor), to the forensic profession, (where acquired remarkable notoriety) and to politics. He was the initiator of the modern civil legislations reform: he published important essays and studies on the civil law, proposed reforms to the laws of the epoch and opened new paths in the field of the public and private law. At 23 years of age he was already revealing himself to scholars of law with a very risky study on the "Possession". Two years later, in the Royal University Of Rome, he was inaugurating the equali­zed course talking about the "study of the civil law in the modern states"; shortly after he was publishing "La nuova fase del diritto civile" (The new phase of the civil law) with which was completing the foundations, that he had already placed, for the substantial regeneration of the civil legislation of the epoch, and on January 25th, 1887 inaugu­rating from ordinary professor his lessons in Messina, where, suddenly, he died five months later. In the few years of life he wrote several books. We remember: "The new phase of the civil right in the economic and social relationships"; "Of possession to gain the fruits" (Naples, Marghieri publisher, 1879); "The property and its limits in the Italian legislation" (Bologna, Fava and Garagnani, 1880); "The political parties in Italy" (Rome, Forzani and C.,1881); "Study of civil right"; "Of the capacity to negotiate"; "Law matters". Died very young people on June 25th, 1887 in Messina, at only 31 years of age, after a short and violent illness. He died on the eve of a plebiscitary election which would have taken him to the Chamber of Deputies ("the joy of his unanimous election of parlia­ment deputy, in a flash, was converted in the deepest mourning, in the disappointment more disheartening", so Benedetto Radice was commemorating him). 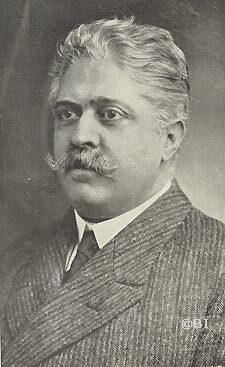 Enrico Cimbali was the first of four brothers who reached high cultural levels in various fields: Giu­sep­pe (1858-1924, jurist, philoso­pher and versatile writer ), Fran­ce­sco (1860-1930, first brontese deputy to Montecitorio Parliament) and Eduardo (1862-1934, fecund publicist, professor of international law). In the photography the four brothers have stood together with the father Anto­nino who was a doctor, cultured, teacher of natural history in the Capizzi College and Mayor Of Bronte since 1862. 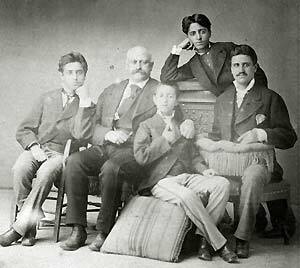 Enrico is the first on the right, next to him Giuseppe, Edoardo, his father Antonino and Francesco. «... I came this morning to visit you and found you hesitating to receive me. Indepen­dent for nature, custom and posi­tion, I do not have anything to ask to anybody. ... I found lowly performed, much lowly, the free and high demonstrations of my mind. I won't bother again to come to see you. 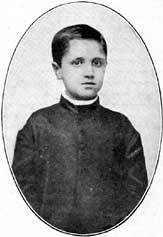 Endowed with big intelligence, with solid juri­dical culture and with independent spirit, so Enrico Cimbali, in a letter of March 23rd, 1981, was writing to his fellow countryman cardinal Antonino Saverio De Luca, powerful Vatican prelate at the epoch. The Cardinal, however, held him in high esteem and when. In 1883, was dying he wan­ted him near and told him: I shall die happy, thinking that there is one, and that is you, who shall continue in the glorious tradi­tions of our country”. Photo of the box on the left: Enrico Cimbali a few months before his death; a very young Enrico Cimbali student at the age of 10 at the Real Collegio Capizzi and a painting that portrays him preserved in Bronte in the premises of the Circolo di Cultura named after him. It was commis­sioned to the painter Natale Attanasio by the same Cimbali. In one of his books "The new phase of civil law", where "became a forerunner of the private law reform", has been translated and used in many foreign countries. Enrico Cimbali represented the deepest synthesis of all the reforming ideas which showed themselves in Italy in that period and from which drew many nations to trace the lines of their new legislations (Germany, Spain, Switzerland, and others). Twenty-four years after his death, the brother Giuseppe, cured in 1912 the publication of the complete works (Torino, Unione Tipografica-Editrice), adding the "Collection of letters" (letters to the father, the brothers, electoral, to the great ones of the epoch) and, in appendix, the "Letters of illustrious Italians and foreigners" written to Enrico Cimbali. 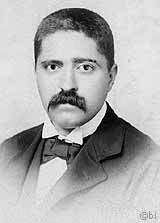 Of him have written the Clovis Belaqua of the University Of Recife (Brazil), Renè Worms, Federico Castejòn, Francisco Esteban (translator of the Spanish edition of the Cimbali book, published in Madrid in 1893). Benedetto Radice defined him «law consultant continuer of the Roman juridical wisdom, author of notes on ancient law matters evolving in accord to the new needs, dignity of the country and the juridical Italy». Vittorio Emanuele Orlando, to the unexpected announcement of his death, declared that the name of Cimbali «Is by now, inseparable part of the history of the juridical disciplines of our time». 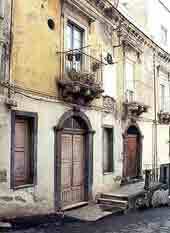 The house in which the four brothers Cimbali were born, stands at the number 39 of Annunziata Street, in front of what was then the town hall (now municipal library). On the house front have been applied two commemorative plaques. 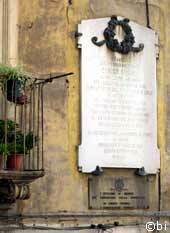 A little downwards, at the number 82 of the same Annunziata street, there is the house in which another great brontese was born: the philosopher Nicola Spedalieri; the plaque on the wall of the house was placed the 13th of October 1878. The first plaque dedicated to Enrico Cimbali, (The largest one placed high above), was set into the wall in 1922. This is how the “Bandiera Bianca” newspaper (year II, n. 16 of the 3rd of September 1922) commented the event). The inauguration of the plaque dedicated to E. Cimbali was an extremely great success. The participation of all Bronte’s associations, authorities and the group of university students who offered a very beautiful laurel crown shows how proud this town is of his Illustrious jurist. Professor G. Maiorana, presented by ‘Commendatore’ Pace (Lord Mayor of that time), remembered the Cimbali, his works and all his life devoted to work and faith, with a superb speech which was like a magnificent scientific dissertation worthy to be publi­shed… Afterwards spoke the ‘Cav.’ Verderame (representing the Government’) who also pronounced words of deep esteem for the One who honors not only Bronte but the entire Italy. From the balcony of the house in which our illustrious fellow-citizen was born, spoke, strongly applauded, Professor B. Radice. For the family moving words of thanking were said by the egregious Professor Giuseppe Cimbali ». 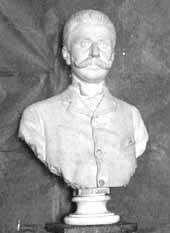 Marble bust of Enrico Cimbali by the sculptor Biagio Salva­tore. It was standing in the “Circle of Culture E. Cimbali” and was destroyed during a bombing the 8th of August 1943. 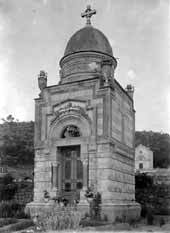 Om the right, The chapel of the Cimbali family in Bronte’s cemetery where Enrico is buried. The image is of the 1902. 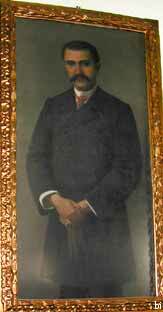 Giuseppe Cimbali, (1858-1924), Jurist, philosopher, was a polyhedral writer. Was the second of four brothers that reached high cultural levels in various fields: the first Enrico, the third Francesco and the last Eduardo. Started his studies in Bronte in the Capizzi College to continue them from 1873 to '76 at Liceo Spedalieri di Catania and then at the Regia Università di Napoli, studying law. 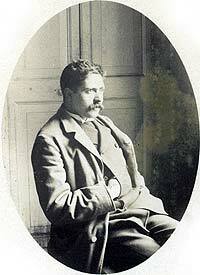 He got his degree in 1880 in Roma, that chose as adoptive country and where he lived for over 40 years. 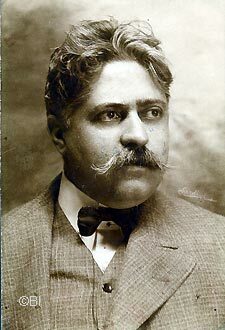 At Roma in 1881 began the large literary production with the book "Confessions of a disillusioned", followed by " Solitary days" (1884), "Half asleep" (1889), "Dawn" (1890), "The century' agony" (1899), etc..
- "The task of law philosophy of the right in the organization of international rapports", etc..
About the book "La Città Terrena", published in 1906 by the National Publishing House Roux and Viarengo, in underlining the reception received in Italy, we want to highlight here the notoriety achieved by Cimbali in the Italian socio-cultural environment. Before being published "La Tribuna di Roma" (year XIII, No. 356 of 23.12.1905) he presented it to his readers: «It, as the title itself announces, should be the antithesis of the City of God of St. Augustine; and, as this summed up the medieval spirit, - so that should be the maximum expression of the modern spirit. Moreover, it would tend to be the opposite of all the ancient and modern utopias, from the City of the Sun, of Campanella, to the Modern Utopia of Wells». Some books were translated and published also overseas. He taught law philosophy in the Royal university "La Sapienza" of Rome. 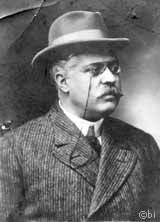 Was also an executive to the Ministry of Public Works, proving his administrative capacity with a critic essay ("Techniques and administration", of the 1902) and supporting the institution of a Ministry that would take care of the Railway or Transports ("For the institution of the Ministry of Railway or transports", Torino Unione Tipografica Editrice, 1912). Was a tenacious assertor and follower of the revolutionary doctrine of Nicola Spedalieri, holding university courses on the philosopher, and, above all, revalued the Work that, when first appeared, (1791) had been ostracized everywhere, and, as years went by, even the memory of it had been lost. Giuseppe Cimbali searched for the precious volume in Naples, Rome, uselessly. As a bookworm (this was one of the two nicknames used by him, the other one was Monte Barca), consulted libraries, public and private archives, diaries, yellowed papers that would mention the Spedalieri, in vain. "Memories of childhood and youth"
«I was born in Bronte, on the western slopes of Etna, from Antonino Cimbali, sur­geon, and from Marianna Leanza. The registrar sets the event to the 13th of March 1858. My mother used to tell me that should be set instead on the previous day and that I was born (the fortune-tellers formulate their horoscope) while over the country town was raging a never seen before, furious storm with extraordinary lightning and thunder. Of the four sons (all males) I arrived second in the family. The first was Enrico, the third Francesco and the last Edoardo. Unlike my brother Enrico — whose prodigious precocity possibly caused his death at 31 and a half years of age, but without first given his name indissolubly to the Private Law’s reform — I was in my early years an object of pitiful oddness, of pain­ful worry. I did not have the typical vivacity, restlessness, gayety of normal chil­dhood. I was not laughing or smiling, I was not looking for the company of boys of my same age. I seemed devoted to solitude, to silence and to inertia. I could stay for entire half days in contemplation I don’t know of what, at home over a chair and in the country sitting over a stone. I was only showing at every hour of the day a great appetite. [...] At a certain point I did, at home, function as the firstborn. Enrico for his incorrigibility had been put in the local Seminary (the Capizzi College); He did not stay there, however. more than a year. I not only was studying very much, but I was also expecting that my two younger brothers would study as much. Giuseppe Cimbali in three archive’s photos; the first was taken at Naples in 1880, the others in 1893, when the Cimbali lived in Rome. A precious and rare photo of Giuseppe Cimbali, taken by his friend the writer Luigi Capuana. On the back an autograph dedication by the Capuana. Bene­detto Radice defi­ned him: "a tire­less agitator of ideas" and "fighter indefa­tigable for the triumph of the people rights". Supporter of international justice and of the juridical organization of people life, Giuseppe years, wrote the book "From international anarchy to the Declaration of the people rights as fundament to United Nations" (Bemporad, Firenze, 1920). After years he found the precious book "Dei diritti dell’uomo" (Of Man's rights) at Recanati, in the house of the Leopardi (the book, among other things, was bearing this phrase written by the poet: "this book talks very well; but unfortunately for everybody, or is not understood, or is understood very badly"). The Cimbali studied in depth the philosopher and published "Nicola Spedalieri publicist of the XVIII° century" (in two volumes, Città di Castello, 1886) and the "Anti-spedalieri, or rather tyrants and clergy against revolutionary doctrine of N. Spedalieri", (Torino, Unione Tipografica Editrice,1909) and, with the nickname of Bookworm "Around Spedalieri, the insults of a century" (Rome, 1899). 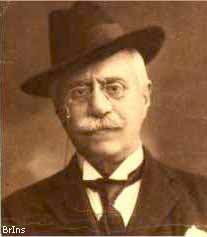 Besides the conspicuous literary production that goes over short stories, novels, essays of philosophy social and juridical, Giuseppe Cimbali directed also two quarterly reviews: "The Spedalieri" (1891-92) and, during the world war, "The rights of the people" (1917-19). Proposed also to immortalize the Spedalieri with a monument in Rome and, with the help of the King, the government and of many writers, philosophers, jurists and politicians, obtained it in 1903. Giuseppe Cimbali mortal remains were transferred to Bronte and buried in the cemetery. To honor him a crowd of students, workers and friends and the banners of many Councils of the Province (from Catania to Linguaglossa). 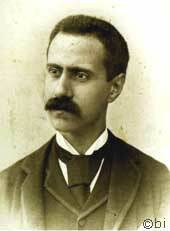 Eduardo Cimbali, (Bronte 1862 – Catania 1934), fecund publicist, professor of International Law at the Royal University of Macerata, Sassari and Catania. It was the last of the brothers Cimbali (Enrico, Giuseppe and Francesco, second brontese deputy to Montecitorio). In an epoch of colonialism and conquest, was a tireless fighter for the freedom of all oppressed people. Published important essays and studies on international law. Some of his assertions, as considering the existing international law false and not true Law, caused him ostracisms of every kind. Among his book we remember "The not-intervention" (Roma-Torino, Fratelli Bocca Editori, 1889), "Bulgaria and international law" (Roma, Fratelli Bocca Editori, 1889), "The State according to universal international law " (Roma, Forzano e C. Tipografia del Senato, 1891). Mach of his work has been translated and divulged abroad.